We’d love your help. 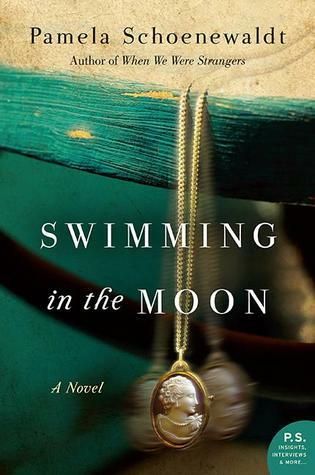 Let us know what’s wrong with this preview of Swimming in the Moon by Pamela Schoenewaldt. To ask other readers questions about Swimming in the Moon, please sign up. Enjoyed this book very much. A very meaty plot with a very determined protagonist. I loved this book. The setting is in an older time and tells some factual history. This story tells of a child dealing with a mother with what we call today mental disorders. An exile to America. A new life. Labor laws and how underpaid employees were trying to make it in a new industrial world. I felt like I could hear beautiful singing and see spectacular chocolate dipping done by hand. Very good detailed book. I got this from Barnes and Noble and was worth every penny! In this early 20th century Italy to America immigrant story, Pamela Schoenenwaldt is juggling many issues: immigration, mental illness, worker’s rights, women workers, mother-daughter relationships, romance, and maybe more. She does not drop any of them. To me, as the reader, there are too problems swirling around at the same time. After a slow start the author finally creates enough tension for the story to pick up. I did want to know how the she was going to wrap up the various issues. She acco In this early 20th century Italy to America immigrant story, Pamela Schoenenwaldt is juggling many issues: immigration, mental illness, worker’s rights, women workers, mother-daughter relationships, romance, and maybe more. She does not drop any of them. To me, as the reader, there are too problems swirling around at the same time. After a slow start the author finally creates enough tension for the story to pick up. I did want to know how the she was going to wrap up the various issues. She accomplishes a decent ending, but not one completely to my liking. See SPOILER ALERT, below. Swimming to the Moon, as a whole lacks the spark or soul that makes a reader want to devour the story and not stop reading. It is an interesting story, but not a memorable one. I read her first book, When We Were Strangers, soon after it came out and felt the same way. Both are immigrant stories which do not have the power of The Shoemaker’s Wife, by Adriana Trigiani, another Italian immigrant story that takes place at the same time and has some of the same, but fewer, issues. What an exceptional book that I did not want to end! This historical fiction starts in the very early 1900s in Italy, with a girl and her young mother, both servants to a Countess. Unfortunate circumstances force them to leave Italy and they find themselves on a ship to America. They are in dire financial circumstances as are most immigrants at the time, and as the daughter takes to school and high school, the mother begins to sing in Vaudeville to earn a living. This life does not last long as What an exceptional book that I did not want to end! This historical fiction starts in the very early 1900s in Italy, with a girl and her young mother, both servants to a Countess. Unfortunate circumstances force them to leave Italy and they find themselves on a ship to America. They are in dire financial circumstances as are most immigrants at the time, and as the daughter takes to school and high school, the mother begins to sing in Vaudeville to earn a living. This life does not last long as the mother is sinking further and further into the ravages of mental illness. The struggles of mother and daughter in this time of early America with the cruel conditions in garment factories and non-existent labor laws are fascinating. I can only urge you to read this amazing book - it will breathe life into the beauties of Italy as well as the life of poverty stricken immigrants in the early days of American manufacturing. Also we learn of the terrible condition of "lunatic asylums" at the time. What I loved about this book: Schoenewaldt deftly relates the Triangle Factory Fire's effect on other cities' garment workers, Cleveland's in particular. Unions and their history in this country are endlessly fascinating to me, and the author offers a great deal of insight into their beginnings. I mostly liked the protagonist, Lucia, though she develops a bit of a martyr complex toward the end of the novel, and her unending idealism is wearing. Still, she is a strong, loving, good person whose de What I loved about this book: Schoenewaldt deftly relates the Triangle Factory Fire's effect on other cities' garment workers, Cleveland's in particular. Unions and their history in this country are endlessly fascinating to me, and the author offers a great deal of insight into their beginnings. I mostly liked the protagonist, Lucia, though she develops a bit of a martyr complex toward the end of the novel, and her unending idealism is wearing. Still, she is a strong, loving, good person whose desire to help others and bring justice to the working class in her adopted country is inspiring. The description of an adult child caring for her mother, taken away by mental illness, is both moving, and, as someone who has been there, entirely accurate. The love a mother has for her child never leaves, as Lucia's mother Teresa explains. Like Vesuvius, it's sometimes hidden in the mist and fog. The child has to remember, it's always there even when it's not evident. I adored the lush descriptions of the villa outside Naples as well as the Italian countryside and people. The juxtaposition between the mild, gorgeous landscape of the Old Country and the coal- and fiber-heavy air of dingy Cleveland with its weather extremes was very well done. Lula, a minor character from Schoenewaldt's debut novel, When We Were Strangers, is fully developed in this book. She supports Lucia at every turn and occasionally acts as her mama, because Lucia doesn't have one capable of helping her. Practical, funny and powerful, Lula is a wonderful character about which I wanted to learn more. What I did not like: The ending is trite, made me dislike the main characters because I just didn't feel anything regarding their futures. The author did not adequately build my desire for the happy ending that finally came about. I, of course, prefer happy endings, but I need to be emotionally invested for them to be meaningful. Schoenewaldt barely let us know Henryk, a central character. She made me believe he was kind, tried to be a good son and citizen and was content to run his grocery store. I did not believe he loved Lucia. I did not believe he fought his parents and convention to marry her. Schoenewaldt spent more time on less important characters. I felt as if Josephine, a wealthy, college-educated Southern belle who decides to take up the cause of unions as she enjoys the notion of free love and showing off in front of large groups of poor people, uses Lucia and many others. She is supposed to be a mentor of Lucia's, so I think the author should have made her more likable. Fourteen-year-old Lucia and her mother Teresa are forced to flee from their home in a lavish villa by the sea in Naples, living in the service of Count Filippo and Countess Elizabetta, following an angry and violent outburst by Teresa. Paolo, a loyal aid to the household is charged with arranging their journey by sea to their eventual new home with Paolo’s cousin Rosanna, who runs a boarding house in Cleveland, USA. Once settled in Cleveland and doing very well with her studies Lucia sets her he Fourteen-year-old Lucia and her mother Teresa are forced to flee from their home in a lavish villa by the sea in Naples, living in the service of Count Filippo and Countess Elizabetta, following an angry and violent outburst by Teresa. Paolo, a loyal aid to the household is charged with arranging their journey by sea to their eventual new home with Paolo’s cousin Rosanna, who runs a boarding house in Cleveland, USA. Once settled in Cleveland and doing very well with her studies Lucia sets her heart on graduating from school and attending college, just like an all American Girl. Teresa holds down a series of jobs and their plans look as though they will be realised until Teresa goes for an audition to join a vaudeville troupe. She impresses at her audition and is euphoric, deciding to use her talent to support Lucia in her studies, whilst travelling between major cities on tour and singing under the title of The Naples Nightingale. Parted from her mother for the first time in her life, Lucia works ever harder at her studies eventually realising her dream of attending college, but scarcely has she settled in than a telegram arrives from Rosanna to say that her mother has suffered a nervous breakdown and has been brought back to the boarding house in handcuffs, cannot be left alone for fear of what she might do and that Lucia must return from college to look after her mother. Teresa’s decent into an unhappy and confused mental state leaves Lucia having to find work, as well as having to take responsibility for the care and rehabilitation of her mother. Friends offer to help but as Teresa’s mental condition worsens Lucia’s life spirals out of control. Strikes for fair employment within the immigrant community leave Lucia struggling financially and at last she feels unable to carry on. Just when her thoughts are at the very darkest point she is offered an opportunity that seems to be the answer to all of her prayers and looks set to transform her life. I really enjoyed this story and loved the character of Lucia, thrust into an adult world while still a vulnerable child. Her determination, her empathy with her immigrant community, her loyalty to her mother and her dogged fight for what she knew was right endeared her to me and made me admire her courage and tenacity. The descriptions of the ways immigrant workers were treated so cruelly and unfairly were heart breaking, brought to their knees in poverty and without doubt treated like slaves. Running throughout this novel were also love stories, stories of celebrations, friendships and kindnesses, all lightening the darkness of the immigrant struggles and atrocities. I would recommend this as a very good read within the genre. Like many other ethnicities at the time, this compelling tale of Italian immigrant strife, struggles, realities and their attempts to fit in and claim the American Dream. Thousands of immigrants changed their cultures and climates for a new land. In doing so, thousands more claimed new names and identities. Fresh starts. A slate wiped clean. Forced to give up their languages, customs and all that they knew in order to be Americans. To “blend” in and no longer be outcast by being and looking “different”. Tenderness and closeness and yet the difficult struggle of the mother /daughter relationship is tested when their roles become irrevocably reversed. The pains one goes through for love, dedication, pride and dignity in order to protect the other. Interesting yet incredibly sad pictures are painted of the often cruel conditions both in housing and factory work. Many of the medical treatments, compared to today’s standards, are not only shocking but seem barbaric, animalistic and inhumane. A powerful tale of immigrant Cleveland and all its’ diverse nationalities that helped make the city, at that time, one of the leading cities in America for garment factories pre WWI. Wow! This book really blew me away! In 1904 Lucia and her mother Teresa leave Naples for Cleveland and a new life working in a factory with thousands of other Italians, Poles, Irish, and Bohemians. At 14, Lucia goes to school, learning English quickly, and is able to scribe letters home for other Italians who can't read or write, earning extra money. Her mother works in a factory dipping chocolates and entertaining workers with her beautiful voice. Lucia's greatest dream is to finish high school Wow! This book really blew me away! In 1904 Lucia and her mother Teresa leave Naples for Cleveland and a new life working in a factory with thousands of other Italians, Poles, Irish, and Bohemians. At 14, Lucia goes to school, learning English quickly, and is able to scribe letters home for other Italians who can't read or write, earning extra money. Her mother works in a factory dipping chocolates and entertaining workers with her beautiful voice. Lucia's greatest dream is to finish high school. As time goes on her mother's sanity becomes more fragile and Lucia takes on the role of parent. The book resonated with me on many levels. I'm a native Clevelander and my grandfather worked as a tailor for Joseph & Feiss, one of the factories mentioned. My mother-in-law also did factory piece work as a teen and always hated sewing as long as I can remember. Her mother came from Bohemia at 14 to work as a maid for a rich Jewish family in Cleveland Hts. and send money home for the rest of the family to come to Cleveland--one of America's biggest & richest cities. When the author mentioned rich women knitting ugly gray scarves to help the poor, when paying a decent wage so they could buy coal to heat their homes would have been more helpful reminded me how some things in our society remain the same a hundred years later. SWIMMING IN THE MOON by Pamela Schoenewaldt is an interesting Historical Fiction set in 1905 Italy and Cleveland,Ohio. What an interesting story on immigrant life in the 1900's. Young Lucia,and her mother must flee the Bay of Naples,in Italy, where they end up in Cleveland,Ohio. Lucia's mother, Teresa, has a beautiful voice but she also has demons. Teresa becomes the Naples Nightingale and works on the Vandeville circuit. While young Lucia is clever,hardworking,and struggles to fit into her new SWIMMING IN THE MOON by Pamela Schoenewaldt is an interesting Historical Fiction set in 1905 Italy and Cleveland,Ohio. What an interesting story on immigrant life in the 1900's. Young Lucia,and her mother must flee the Bay of Naples,in Italy, where they end up in Cleveland,Ohio. Lucia's mother, Teresa, has a beautiful voice but she also has demons. Teresa becomes the Naples Nightingale and works on the Vandeville circuit. While young Lucia is clever,hardworking,and struggles to fit into her new life in America....but she is not alone in her struggles. "Swimming In The Moon" is a beautifully written story that is the greatest of stories, the love between a mother and daughter. With her attention to details, her vivid descriptions and characters who are alive with passion,you can not go wrong by reading "Swimming In The Moon". Fast paced story of the struggles of immigrants and the life they wish to create in the new America. A powerful and compelling story!! Received for an honest review from the publisher. The story deals with mother-daughter Italian immigrants, and how they find their way in Cleveland, Ohio. The novel details how they survive within an early 20th century harsh environment. The book begins in 1904, and the time period and struggles to live are depicted strongly, from women's rights, factory work, workhouses, boarding houses, the ability to buy food and clothes, and basically every daily life situation. Within Cleveland, the immigrant world is abundant, with immigrants from all over The story deals with mother-daughter Italian immigrants, and how they find their way in Cleveland, Ohio. The novel details how they survive within an early 20th century harsh environment. Within Cleveland, the immigrant world is abundant, with immigrants from all over the world, including Italy, Poland, Bohemia, Germany and Jews from everywhere. Shops depended on immigrant workers to buy their goods. Boarding house owners depended on the mills and factories in order to survive. The details of life were vividly illuminated in Swimming in the Moon. I initially was going to rate this novel 3 stars. I liked the immigrant and historical aspect of the story line, and that being said, I decided to rate it 4 stars. This is GOOD!!! Born in Italy, Lucia and her mother immigrate to America and try to settle into Cleveland. Lucia has her own ambitions but they are cut short by her mother's descent into madness. She meets Hendryk a Jewish boy at an English class at the immigrant center but feels it is no good as he has to marry where his parents say. Good in math, she gets a job in accounting but soon seeing how badly immigrants are treated at the jobs they are desperate to keep, she finds something else to do a This is GOOD!!! Born in Italy, Lucia and her mother immigrate to America and try to settle into Cleveland. Lucia has her own ambitions but they are cut short by her mother's descent into madness. She meets Hendryk a Jewish boy at an English class at the immigrant center but feels it is no good as he has to marry where his parents say. Good in math, she gets a job in accounting but soon seeing how badly immigrants are treated at the jobs they are desperate to keep, she finds something else to do and finds her voice. There is a lot more going on in this novel but I do not want to spoil it for any future readers. This lovely, simultaneously sad and uplifting story of immigration weaves the intimate lives of our main characters into the great movements of the early 20th century. The relationships are touching, and I appreciated the focus on the topics of poverty, labor, mental illness, and diversity among migrant populations. Love (in friendship and romance) is threaded throughout. I recommend this to anyone interested in the early 20th-century American experience. A beautifully drawn novel about what is the deepest and most important love story of our lives - that of a mother and daughter. Swimming in The Moon brings history alive with such passion and attention to detail - I was just carried along by the characters and did not want the story to end. A book to to savor by an accomplished female voice. Loved it. Teresa and her daughter are servants to a wealthy countess in Naples. Their lives change in a heartbeat and they flee to America. I loved how the story wove together their personal struggles against the struggles of all immigrants and workers in early twentieth-century America. I honestly could not put this book down; I was completely taken in by the characters and their story. A depressing story with an incongruous fairy tale ending. Simply Amazing! Especially for anyone that appreciates high-quality Historical fiction. This book is breathtakingly beautifully written! Interesting time in America fighting for the LIGWU. Made me appreciate the safety and laws in place for jobs today! Also a great story dealing with mental health issues, when there were few viable choices for treatment. Also a nice love story. I would recommend this book for good historical fiction and an in site into the immigrant’s life in America. My mother was born during this time to immigrants from Europe. Lucia and her mother are forced to flee their home in Naples when one of her mother's outbursts costs them their home. They travel across the Atlantic to Cleveland, where Lucia's mother finds fame on the Vaudeville circuit and Lucia attends school and dreams of going to college. When her mother suffers a breakdown, Lucia has to take care of her and begins to wonder if any dream is possible. This was a heartbreaking and frustrating book, but relatable and uplifting at times. The book shows the str Lucia and her mother are forced to flee their home in Naples when one of her mother's outbursts costs them their home. They travel across the Atlantic to Cleveland, where Lucia's mother finds fame on the Vaudeville circuit and Lucia attends school and dreams of going to college. When her mother suffers a breakdown, Lucia has to take care of her and begins to wonder if any dream is possible. This was a heartbreaking and frustrating book, but relatable and uplifting at times. The book shows the struggles that women and immigrants in the early part of the 20th century had to deal with: hazardous working conditions, lack of mental health care/facilities, discrimination and assault. The book also shows the triumph of the human spirit and how a community can come together to help one another, even when they don't have much to give. The fight for good working conditions and education is a big theme of the book and there are strides made during the story. I liked that unlike other books I have read on similar subjects, this book was not set in New York City. There were other places in America dealing with the same issues. I liked the book, but I did have trouble figuring out what the story was supposed to be about: the mother daughter relationship, the dreams of college and a better life, the labor movement or mental health care. There was a lot going on and it was a bit hard to follow at times, but other than that it was a good story. Starting in an enchanting villa in Naples, and switching to Cleveland, this is a fascinating look at the immigrant experience. A mother daughter story that involves mental illness, and questions of family responsibility and obligation, I found much to ponder, and also to enjoy. The historical part of the book was well done. However the story line of Lucia and her mother was a bit too drawn out. And Lucia always seemed to look at the dark side of every issue, worrying about all the bad things that “might” happen. Very good book! Highly recommend! Not my favorite book for sure. It started with one story line, which led to another and then another etc. ending up with a main story of unions and strikes. No thank you! Gives the reader a view into the struggles of the immigrant worker in America and their struggles to assimilate while dealing with family responsibilities. Excellent book. I really enjoyed this book. This was my first book in the historical fiction genre. I found the descriptions very immersive and I really enjoyed learning more about the working conditions in the early 1900s in America. It really gave a true daily life feel of what people went through.